The U.S. government has appointed what the media is ludicrously billing as an “independent” group of health advisors whose job it will be to whitewash adverse reactions to the swine flu vaccine and “explain” them to the public as mere coincidence. Authorities have been busier honing their propaganda about the H1N1 inoculation program than they have dealing with the actual rollout of the vaccine. A $16 million dollar campaign to coerce Americans into taking the shot is falling flat on its face with increasing numbers rejecting the necessity to take the shot amidst concerns about its side-effects. Health authorities have been desperately pushing the notion that the vaccine is safe as part of a gargantuan PR campaign, without explaining why well-connected members of the elite have had special access to an additive-free version of the shot that doesn’t contain ingredients like mercury and squalene that are contained in the public version. 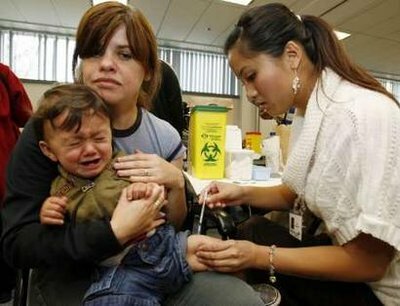 As a result of the dangers of the H1N1 vaccine becoming widely known, authorities are moving to get out ahead of the story by acknowledging that millions of health problems in the aftermath of a vaccination campaign will be blamed on the vaccine, citing the 1976 swine flu debacle when the shot proved far deadlier than the actual virus. Authorities therefore resolved to dismiss any connection to the swine flu shots a host of heart attacks, strokes and miscarriages that “will be blamed on the H1N1 vaccine”. Now the government has accelerated these efforts by appointing a group of “independent” experts to “track the vaccine’s safety,” according to an Associated Press report. The claim that the group is “independent” is a complete misnomer. How can a group appointed by and dictated its brief by the government be considered “independent”? In addition, the group will be headed up by none other than Dr. Marie McCormick of the Harvard School of Public Health. McCormick and her affiliated organizations have routinely issued reports over the past 10 years supporting the government’s position on the link between vaccines and autism, dismissing a correlation entirely despite overwhelming evidence that contradicts this notion. McCormick has been widely criticized by other health experts for her dogged denial of the link between vaccines and autism. So far from being “independent,” the group is in fact appointed by the government and lead by one of the government’s chief whitewash proponents in the context of vaccine dangers and side-effects. The rollout of the vaccine has been limited to far fewer people than the government originally intended, partly due to a supply shortage and partly because more than half of Americans have refused to take the shot. The government’s efforts to dismiss concerns about side-effects will likely kick into high gear when more batches of the vaccine become available. Watch a report from CBS News below.